The Art on the Faith Trail event is returning this July from the 1st – 31st. After last year’s succesful event Raul Speek and Rev. Sarah Geach have decided stage the event again this year! The difference being that a Committee has now been formed to cover more ground. With a good turnout of artists and 11 churches involved this year promises to be another success! This year the event’s stretch over the full month of July and span the whole of Pembrokeshire from St Davids to the Gwuam Valley! 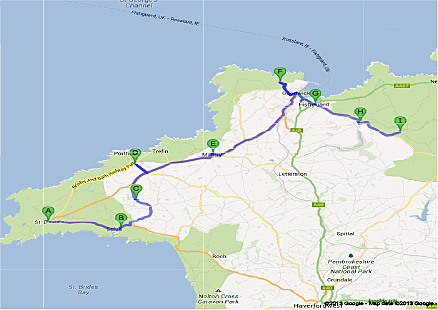 To help locate the churches here is a map of each of the nine taking part. There will be a launch event held in St Davids cathedral on the 24th of June at 4pm and more information will be available in the form of posters and flyers. Do come on the 24th and then take the pilgrim’s trail and discover local art in a truly memorable way!